Sometimes you need a basic dish that will go with just about anything. The other day my sister asked me how to bake sliced potatoes. It’s surprisingly easy and simple. I have made them before so I pointed her in the direction of the roasted potato recipe and the Greek roasted potato recipe to give her a couple of options to choose from. Those recipes are oldies but goodies and it made me wonder if there was maybe a better way to make roasted potatoes. That’s where these crispy baked potato wedges come in. I almost didn’t blog about this recipe. They took a long time to make, used a ton of electricity, and seemed like they might actually never be done. While I watched the potatoes boil I was annoyed that I had to babysit them. When I baked them, I was annoyed again that I had to babysit them. So what’s the big deal? I think they just take longer than you expect so you have to keep making sure you haven’t destroyed them at the same time as you haven’t just stopped early with raw potatoes. Anyway, I decided to blog about these potato wedges. After all the babysitting and time, they really are pretty fantastic and that means they are worth sharing with you. I’ll let you decide whether or not you are in the mood make them yourself. Wash the potatoes and cut them into quarters. Lower the heat to a low temperature setting and add the potatoes. Let them simmer for about 10 minutes or until they are tender when you poke them with a fork. Drain the potatoes and then put them back into the hot pot to help boil off any excess water. Add the oil and gently toss them until they are all coated. Spread the potatoes onto a baking sheet and bake them for about 30 minutes or until they are golden brown. 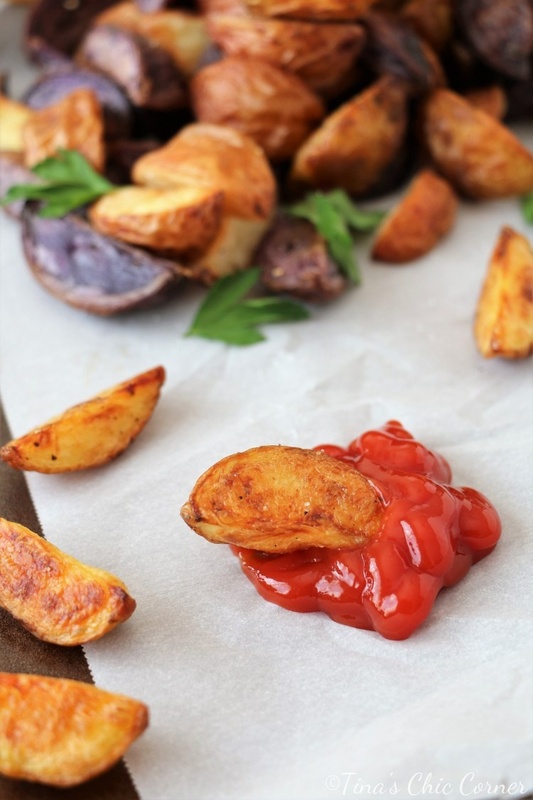 Every 10 or so minutes flip the potatoes to make sure that all of the sides get browned during the cooking process. These potatoes look delicious, Tina. I think they are worth the time to make….and I will too.